These chicken kababs or Kebab Digi couldn't be easier to make. One thing is necessary - you MUST let them marinate overnight or they won't taste as they should. No, a six hour or eight hour marinade won't do, they MUST marinate overnight - or longer. They have a fabulous subtle flavor that'll be unlike anything you've ever tasted before. It's my favorite way to cook chicken kebabs. This recipe can be found in the cookbook Sephardic Cooking by Copeland Marks. Put the saffron and sugar in a small bowl. Using the back of a spoon rub them together to break up and blend the saffron into the sugar. Add one teaspoon warm water and dissolve. Mix everything together and marinate overnight. Skewer the chicken and cook until done. 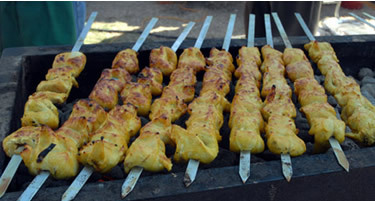 These kebabs are best, and authentic, when cooked over a coal fire. However, they can be cooked under the broiler, in a frying pan, stove top grill or gas grill.